Every so often we’ll catch a glimpse of a celebrity or famous name playing a game of beer pong. In recent years, we’ve enjoyed “private” pictures or footage of the likes of Justin Bieber, Carmen Electra, and even the great Michael Jordan stepping up to the table to play a good ol’ fashioned game of pong. Jimmy Fallon has also run a few pong bits, which has given us the pleasure of checking out some of our favorite celebs’ pong games over the years. Jennifer Garner, Kate Bosworth, Maria Sharapova, Salma Hayek, Kathie Lee Gifford, Sofia Vergara, Anna Kournikova, Naomi Watts, Helen Hunt and perhaps my favorite, Betty White (amongst others) have all stepped to the table to play The Tonight Show host. This past weekend provided us with some more celebrity pong action. This time, not even the Secret Service could keep the photos from surfacing all over the internet! 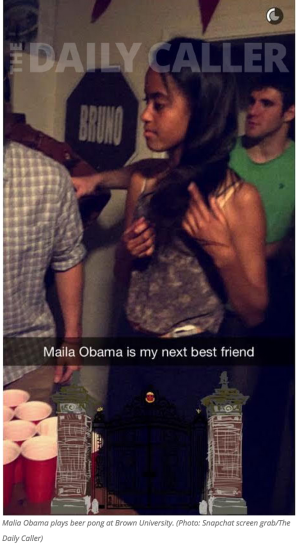 Seventeen-year-old, Malia Obama, was spotted at a Brown University party knocking down cups on a beer pong table at a dorm party. Yes, that would be The President of the United States of America’s daughter. For more information on The World Series of Beer Pong or anything related to Beer Pong, please reach out to us at [email protected]!